Last Friday about the same time that NPP goons were almost killing Efua Djansi Asamoah of Joy Fm in Ho, other agents of the party were busily printing ballot papers at a printing house at Laterbiokorshie, in Accra. The Name of the printing house is ACT commercial Press. 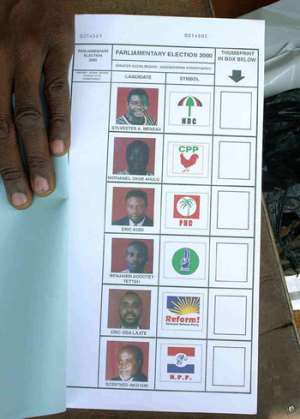 Upon a tip off, the NPP agents were caught red handed in the act of printing tens of thousands of ballot papers. Kofi Portuphy of the NDC in an interview on Joy Fm and Radio Gold recounted how upon a tip off he moved over to the place and was shocked to see that the report he was given was accurate. Earlier in the same day, a coffin filled with ballot papers thumb printed in favour of the NPP was intercepted in Aflao through the vigilance of the driver of the vehicle that the coffin was being put into. The culprits were rounded up and the Aflao BNI is investigating this and other incidents on Ghana's eastern frontier. Meanwhile, Jubilee Fm in Keta, an affiliate of Joy FM was last Friday attacked by agents from Togo. The equipments of the station were ransacked and put on board of the vehicle with a Togolese number plate. But for the vigilance of the police the assailants would have sped off en route to Togo where they came from. It is believed that the intent was to disable the station in order to prevent the broadcast of the planned massive rigging and harassment in many constituencies in the Volta Region. In a related development a vehicle belonging to the Deputy Regional Minister, Mr. Kofi Dzamesi, is said to have been arrested last week with a cache of arms on board.